How Can You Protect Yourself and Your Business from Bankrupt Debtors? The New Jersey collection law firm of James S. Friedman, LLC, understands the bankruptcy process, as well as the traumatic effect it can have on a business seeking to collect a perfectly legitimate debt. Few things are more frustrating for a business owner than receiving a computer-generated notice in the mail stating that one of its account debtors has sought bankruptcy protection. Unfortunately, this happens all too often. When all other efforts to evade payment of a perfectly valid obligation have been exhausted, debtors will frequently try to run and hide in a federal bankruptcy court. Clients frequently assume that this will effectively terminate any chance of being paid, but that is not necessarily true. Clients that receive bankruptcy court notices have many questions and concerns. They want to know if collection efforts must stop; whether they can keep any monies received from the debtor prior to the commencement of the bankruptcy case; whether they can do anything to protect themselves in the bankruptcy court; whether the debtor even has the right to seek bankruptcy protection; can the case be dismissed; whether it is possible to vacate the automatic stay and continue collection efforts, notwithstanding the bankruptcy filing; and, whether they should attend the first meeting of creditors and question the debtor regarding what precipitated the bankruptcy. Because of the cumbersome and unpredictable nature of the bankruptcy process, most commercial creditors would undoubtedly benefit from retaining a New Jersey collection law firm that understands the collection process, the bankruptcy process, and the interplay between the two. Using a collection firm that can function in both arenas helps ensure that a business creditor is properly advised and protected as fully as possible at every stage of a collection case - even those that may be totally unanticipated. James S. Friedman, LLC, has considerable bankruptcy experience. Mr. Friedman is a former law clerk to a New Jersey bankruptcy judge, and has had substantial exposure to the bankruptcy process. Thus, in such matters, the firm can represent clients at creditors' meetings, and file motions and adversary proceedings in the bankruptcy court to protect client interests. In appropriate cases, these motions or adversary proceedings can result in a client's debt being excepted from the debtor's bankruptcy discharge or, possibly, even a dismissal of the debtor's bankruptcy case. 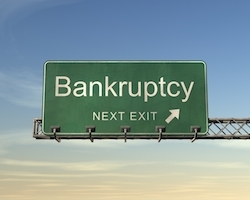 Clients must remember that bankruptcy does not necessarily spell the end of all collection efforts. It does, however, present additional challenges that must be responded to with skills that differ from those required for collection work. It therefore makes sense to use a law firm that understands collection work and the bankruptcy process. If you want to learn more about the effect that a bankruptcy filing can have on your debt collection efforts, call James S. Friedman, LLC, at 800-361-6554 (toll free) or contact us online.